What Are Best Men’s Electric Shavers for Sensitive Skin? I used to be one of those guys that hated men’s electric shavers. I would almost always get irritated skin. It wasn’t the razor’s fault and it wasn’t because I didn’t know how to use electric shavers. I just have really sensitive skin and using one dry would just be really uncomfortable. Then as the years went on, they got better. Now you can even use them wet in the shower or with shaving cream to really avoid any razor burn. Plus, the way the head is designed to be gentle means that even I can finally use an electric shaver myself! They aren’t all created the same. Some are still better than others for guys with sensitive skin. If you are looking to get into shaving with an electric shaver but aren’t sure if your face can handle it, then make sure you read the full reviews. Years ago if anybody had asked me which one is best for sensitive skin, I would not have hesitated even a second and said “Foil”. Though generally it still holds true that foil razors go easier on your skin, there are some rotary electric razors that are pretty good for preventing razor burn. The reason that foil electric men’s shavers are better in general is that the foil covering the blades glides better across the skin. Another reason is how they are used. With a rotary electric razor you have to go in circular motions to shave. This ends up having you going over the same spot a few times to get all the hair. And the motion can end up pulling some of your hair instead of shaving them. This is especially true of the cheaper models. Which is why I highlighted the ones that don’t yank the hair. To shave with a foil razor, you just go up and down in one direction. The blades underneath rock back and forth so they end up making less contact with the skin than with rotary. As I said, the rotary razors I will review in detail further down are still good for sensitive skin. If you are in doubt, then you should go for a foil one as they will always be good for you. One of the key things to keep you from getting razor burn from an electric razor, is that you shouldn’t need it to go over the same spot over and over again. When you do this, you end up rubbing your skin raw. Here are some of the things to consider that will mean less irritation. The best electric shaver for sensitive skin will lift the hair before cutting it. If your hair is lying flat against the skin, it is difficult for the blades to get at it. This ends up making you keep running the shaver over the same area. And even then you can’t get those stubborn hairs. If you have hair that grows in multiple directions, then this is especially important. You’ll need the razor to lift the hair and to be able to cut in different directions. If you look at the middle section of the picture above you can see some teeth. That is a pre trimmer that lifts up the hair so the razr heads on either side can cut it effectively. Not all electric shavers will have those pre trimmers in the middle, some may even have them on either side of the head. It doesn’t matter where they place them, it is just very helpful to have them. One of the biggest reasons you may feel razor burn is that your face is not lubricated when you shave dry with an electric razor. You can eliminate this by shaving wet. That can mean shaving in the shower, or by using shaving cream. Some guys seem to be conflicted by using shaving cream with an electric razor. Why not just use a regular razor? Well, if you have very sensitive skin then shaving with a cartridge razor is even worse than using an electric. Having your face lubricated, either by being completely soaked or by using a pre shave lotion specifically for electric razors, will help the blades to glide over your skin. Less drag means less irritation. When your facial hair stubble is wet, it gets thicker and easier to cut. It is also more flexible, so the razor can lift it better and make sure it gets cut. If you use a pre shave lotion or a shaving cream, then the lubricants in that will help the blade keep from catching as you push it against your skin. The best electric shaver for sensitive skin has a high RPM or SPM. Those stand for either Rotation Per Minute of Strokes Per Minute depending on whether we are talking about rotary or foil electric shavers. Obviously the faster the blade works, the faster you are done with the shave. The less time it takes, the less irritation you’ll feel. There are some that even vibrate to make sure it doesn’t irritate the skin. This is probably the most obvious thing that you’d want in a men’s electric shavers. Even if you don’t have sensitive skin. If you are prone to irritation then the sharper the blades, the less you have to run the blades over the same spot on your face. As I mentioned already, that is the main cause of razor burn. This can be avoided by sticking with brands that are known for having the sharpest blades. 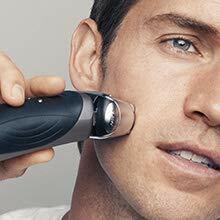 Using a men’s electric shavers the proper way is vitally important for us guys with sensitive skin. It may seem like all you have to do is turn it on and let it rip, but there is more to it than that. No matter how you shave, you’re going to get the best results when you make sure your face is ready for the shave. This entails making sure your skin is hydrated. Even if you prefer to dry shave, you should make sure that the blade won’t drag against your skin. The first thing to do is to wash your face. Or, add some pre shave lotion as I mentioned in the last section. This will protect your skin from irritation. If you decide to use shaving cream, make sure to really rub it into the skin. This will not only keep your skin hydrated, but will lift u the hairs making them easier to cut. No, I don’t mean for you to hold it at a 90° angle. I mean to hold it at the right, proper angle to make sure you are cutting the hair effectively. If you are using a foil razor with a rounded head, then the angle doesn’t matter so much. Using a rotary style razor means making sure the heads are flush against the skin and not at an angle. If you push the blade against the skin you may feel like you are going to get a closer shave. The opposite actually happens. You’re actually pushing the hair down against your skin which makes it harder to cut. Then you have to go over the same spot over and over so you get more and more irritated the harder you press. Electric razors don’t cut longer hair well. To get the best results, shave often. Your hair shouldn’t really be longer than stubble to get the best shave. If it is more than stubble, you may want to make sure you have an electric shaver with a pop up trimmer to cut the hair down, or use a dedicated trimmer to shave down to a manageable length. If your skin sags anywhere you risk not only razor burn, but also nicks and cuts. With your free hand pull the skin tight as you can. The hair will lift a little bit so it is easier for the blade to cut it. Once your shave is done, you still have work to do. Now you need to treat your skin so it won’t burn or feel raw. Use a good aftershave lotion or balm. If you have sensitive skin your best bet is a balm as it is a cream and doesn’t usually have any alcohol in it. The aftershave should leave your skin feeling refreshed, hydrated and cool. And as a bonus some of them smell really nice. You may not feel like it is going to work out for you the first few shaves. If you feel like you’re just not getting how to use electric shavers, just stick with it for a bit. It may just be that you need to get used to it. It could be that your skin needs to adapt to using an electric shaver since it is so different than using a regular or cartridge system. There are pretty much two different brands leading the way in electric shaving technology. 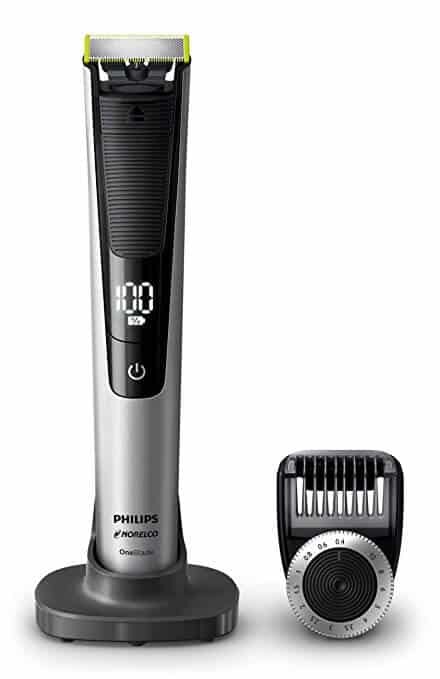 Braun and Philips Norelco both have comfort and effectiveness in mind with their designs. 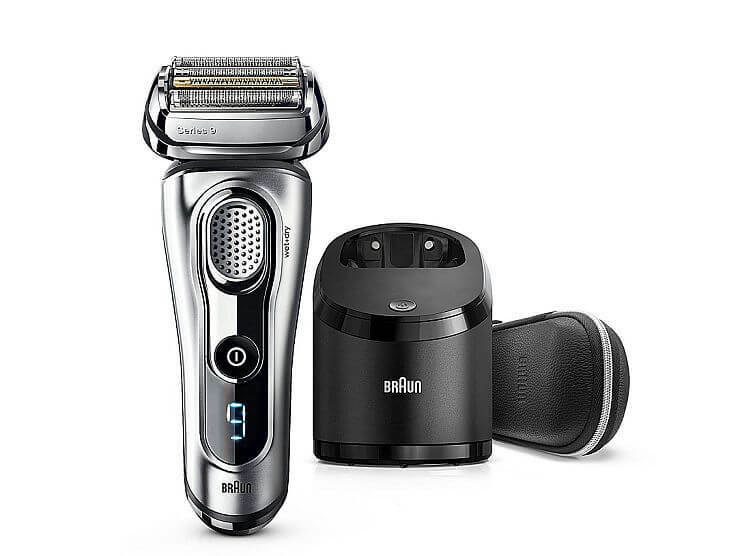 Since guys will just abandon shaving with a men’s electric shavers if it isn’t comfortable, Braun and Philips make sure that guys with sensitive skin can use their products. Here’s a shortlist of the models I think give you the closest shave with the most comfort. And if a guy like me with really sensitive skin can use it with comfort then you know they will work even on your sensitive skin. Of course Braun makes the top of the list. 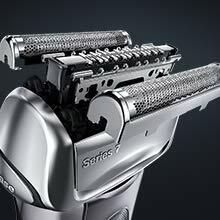 They have been making incremental improvements with each new Series electric shaver culminating with the Series 9. For guys with sensitive skin, this is like the Holy Grail when looking for the right men’s electric shavers. Featuring two foil shaving heads covering really sharp blades, two titanium coated trimmers and a skin guard. Having all of these elements working together makes it easy to get all the hairs in just one pass. The trimmers will lift up the most stubborn hair so they can get cut by the shaving heads. Having two shaving heads on either side helps to catch any stray hairs that the first one didn’t get. To really lift the hair, the Series 9 pulses sonically with 10,000 micro vibrations. In case you haven’t seen the trend yet, the most important thing a men’s electric shavers can do is lift the hair. Pretty much everything depends on that so you can get a smooth, close and comfortable shave. By doing this, you can trap more hair through the holes in the foil which then get cut a lot faster. Adding to the comfort level and cutting efficiency is the fact that all of the heads are on buffers. They can follow the contours of your face no matter how angular your jaw is. Because the heads seem to float, if you push too hard, they are very forgiving. You won’t have the blades rubbing against your face causing irritation. If you think you don’t know hot to use electric shavers, then this is the best one to start with. You don’t have to worry about holding it at the right angle since it will adapt to the contours of your face. The best electric shaver for sensitive skin wouldn’t be complete if you couldn’t use it wet or dry. In the shower or with shaving cream or gel, you can use it however you like. Even dry this will hardly cause any irritation even for guys with unforgiving skin. I mentioned earlier in the article how sharp blades are obviously very important when you have sensitive skin. Taking care of your blades is essential to keep them sharp. Which is why the charging station that doubles as a blade wash and disinfectant is so genius. You don’t have to do anything to keep your blades from getting gunked up. You don’t even have to oil them. And your electric shaver is charged at the same time. I love it. There are a lot of things to love about these men’s electric shavers and I could drone on and on about it. Instead, if you want to know more, check out this full review we did of the Series 9 a while back. I mentioned that even rotary electric shavers can be good for sensitive skin. But, they need to be top of the line otherwise they may be a little rough for most guys. This is the absolute top of the line when it comes to rotary style razors, and it only makes sense that it would be made by Philips Norelco. One of the keys to this giving a comfortable shave is the fact that the heads can move in so many different directions independent of each other. It isn’t enough to have the head swivel to get around the contours. Each rotary blade can pivot around to really make sure it is always flush with the skin. Norelco claims this system cuts 20% more hair off of one pass than most men’s electric shavers. This means less irritation since you won’t have to keep running over the same spot. It also prevents the hairs from getting pulled. I love when a grooming tool gives you so much control. If you don’t know how to use electric shavers, the thing to remember is that you want it to be able to cut a lot without going around the same spot. With that in mind, you can change the speed to slow to go easy on your skin. Since it cuts so close and you cut more thanks to the 8 directions the heads can move, it means that even going slowly will cut a lot and still save your skin. If you feel bold you can set it to medium or fast for a really high powered shave. Even though this is much easier on the skin than a typical rotary, I still recommend you hedge your bets and use this wet. With shaving cream it really glides over your skin and is very gentle on your face. Even dry it works well with sensitive skin, but you should at least make sure you followed the steps I laid out in the how to use electric shavers section. If you don’t want to deal with the mess of using a shaving cream, then taking it in the shower with you is always a good idea. Just like the Braun Series 9 this has a charging station that also gives the 9300 a deep clean and disinfects. Washing those blades of all the gunk that can collect will keep them sharp for a long time. The solution to clean the blades is alcohol free to go even easier on the skin. In addition to keeping the blades clean, it also lubricates them to reduce friction. I am a Braun guy so if I had to choose between this and the Series 9 I would go for the Series 9. However, some guys love rotary systems but don’t love how they treat their skin. This is great for those guys as it is so gentle and effective even on the most sensitive skin. If your skin is only slightly sensitive and you only occasionally get razor burn, then you could use the speed settings to take it up a notch and go for a faster speed. That is a nice way to go since not everybody’s skin is as sensitive as everybody else’s. The bottom line is that this is one of the most exceptional men’s electric shavers whether you have sensitive skin or not. I hesitated to put this up as it doesn’t exactly qualify as men’s electric shavers. It is actually a hybrid trimmer and shaver in one. I’ll keep the description brief as I wrote up a longer, more detailed review of the OneBlade Pro that you can read here. It has a unique shaving head that is similar to a foil one but instead of being curved, it is totally flat. On either side of the foil cutting blade, there are trimmers. You can shave your full beard down without needing another trimmer to bring the beard down to a manageable length. And if you tilt the trimmer on its side, you can use either of those trimmers as an edger or detailer trimmer. It can be shaved in any direction and you really don’t have to know how to use electric shavers to operate it as it is dead simple. The way it is gentle on the skin is that it doesn’t shave down as close as most electric shavers. It will leave a very slight stubble. If you’re the type that would rather shave more often and leave it a little stubbly then you will like the fact that this will still be gentle on your skin. You can also use it wet or dry. Go ahead and throw some pre shave lotion on or some shaving cream if you like having it more lubricated. But, if you do decide to go dry, it really won’t leave your face raw and razor burned. 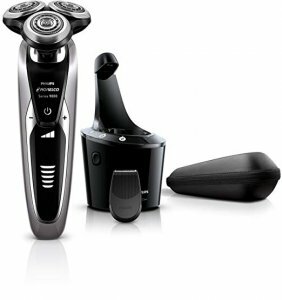 Though this is not an actual men’s electric shavers system, it has its place and some guys will actually prefer this. Since it is also a fraction of the cost of those other two razors I reviewed, then you really don’t have much to lose by going for this option. This wasn’t a huge and long winded review with tons of different models of men’s electric shavers. And there is a reason for that. If you have sensitive skin, then these are the only ones you need to be looking at. They are pretty much guaranteed to go easy on your skin and give you a razor burn free shaving experience. With the tips I laid out on how to use electric shavers and one of these in your hand, then you really can’t go wrong. Men’s electric shavers are not for everybody and especially if you have sensitive skin, so if you have any questions about these or other models then let me know by dropping a comment in the box below. I’ll get back to you with an answer!